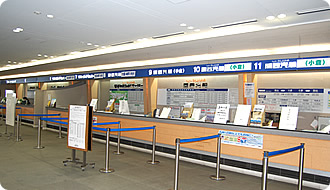 After the boarding procedure at the vehicle ticket office, please wait for the boarding guide. 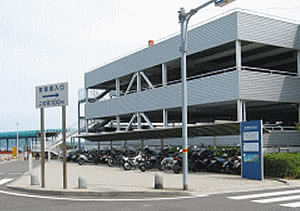 Park your car at each ferry Parking Lot while waiting. 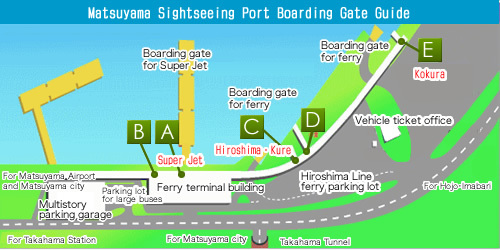 Regarding the vehicle fare and various discounts, please refer to the webpage of each ferry company. 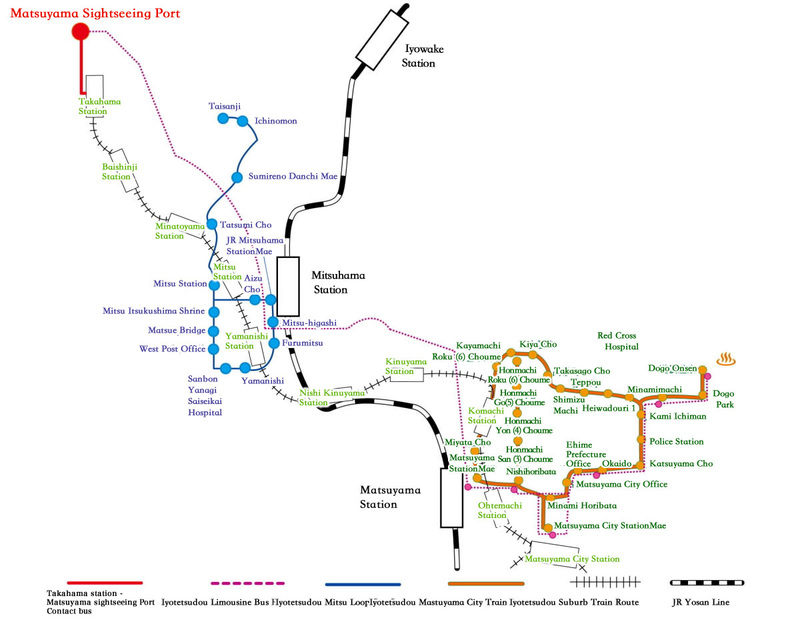 Because of regular inspections or other reasons, there may be suspended service or schedule changes. 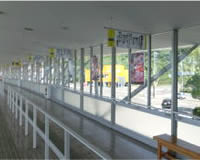 Please check the webpage in advance. 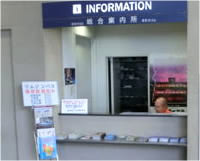 ・Ticket sales will start 30 minutes before departure. 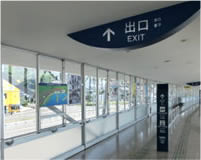 ・Embarkation will start 10 minutes before departure. 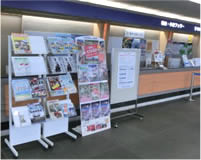 ・Ticket sales will start after the previous ferry’s departure. 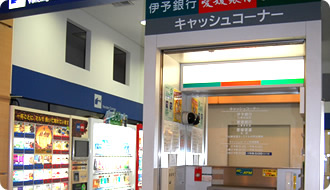 Regarding the various discounts, please refer to the webpage of the ferry companies. 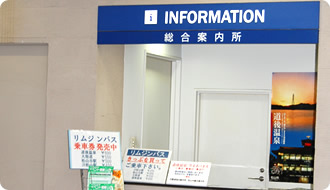 Because of regular inspections or other reasons, there may be a case of suspended service or schedule changes. Please check the webpage in advance. 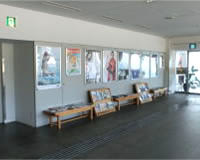 ・Ticket sales will start 50 minutes before departure. 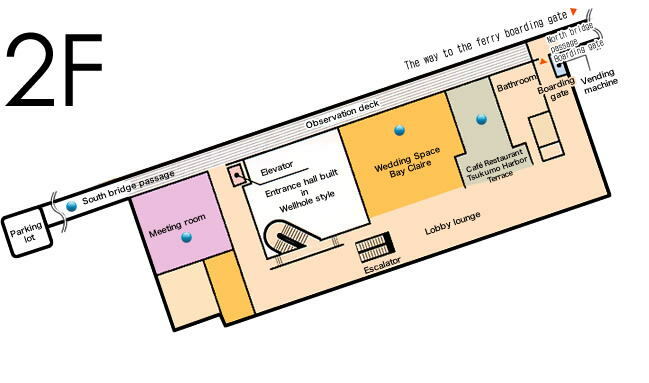 For more information about the vehicle fare, each class’s passenger fare and various discounts, please refer to the webpage of the ferry company. 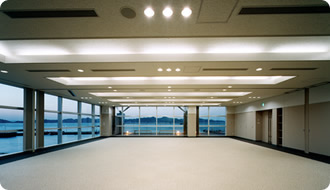 ・Ticket sales will start at 20:30. 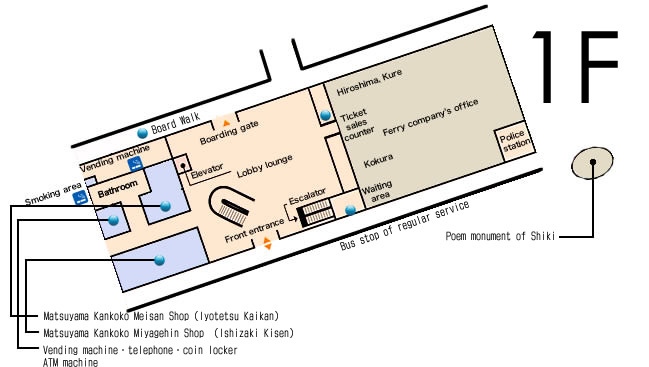 ・Embarkation will start between 21:00 and 21:20. 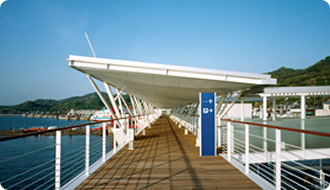 Relax yourself feeling the seasonal breeze until your embarkation. 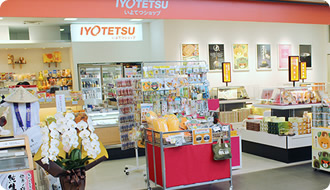 To preserve your memories of Matsuyama, please bring back some local products as souvenirs. We hope you will share good and happy memories with your family and friends who are waiting for you to come home. 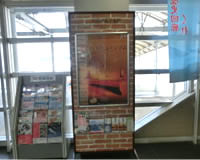 Please bring back some local sweets with your good memories, such as ‘Harukagumo’ by Utsuboya or ‘Ichida no kumo’ by Poem, which were inspired by ‘Sakanoue no kumo.’ (A novel by Shiba Ryotaro. 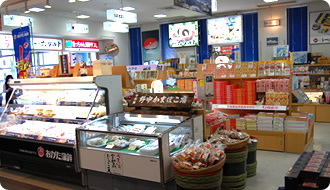 Some characters in the novel are from Matsuyama). 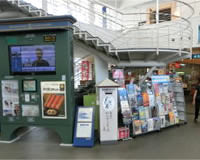 Please come to the counter for the embarkation procedure before boarding. 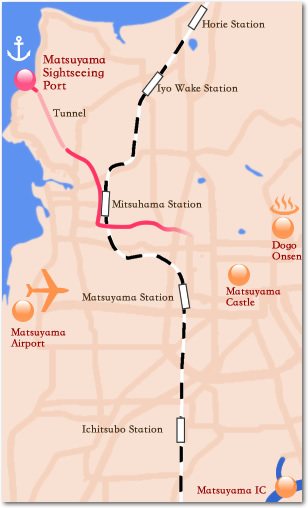 Please come to us for the tourism and accommodation information in Matsuyama city. 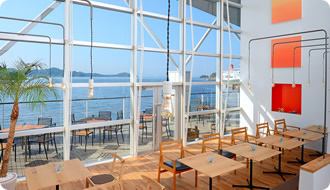 A port cafe with pictures quescenery has been newly opened.Enjoy the various dishes and café menu overlooking the beautiful and calm scenery of Seto Inland Sea. 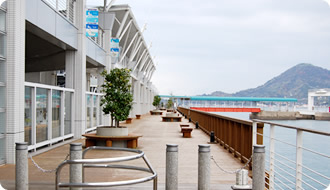 You can also feel the pleasant sea breeze on the open terrace. 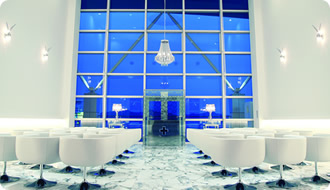 With the superb 180 degree panorama view of the sky and the sea, your dream wedding comes true. Enjoy the day as if you were in a resort with your important guests. Your day will be filled with an excitement and a relaxed feeling. Please use for meetings or lectures. 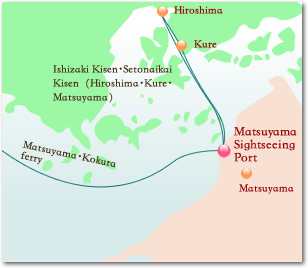 For more information, contact Matsuyama Sightseeing Port terminal Co., Ltd.
Setouchi Inland Sea will welcome you as soon as you get through the boarding gate. The sea breeze brushing your face excites you with a good expectation on your new journey. 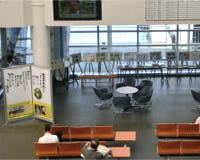 The free wireless Wi-Fi is available at the lobby on the first and the second floor in Matsuyama Sightseeing Port Terminal. 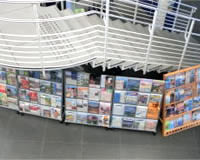 There are some tourism posters and pamphlets. Please utilize to plan your trips. ※The time and the fare are subject to be changed. 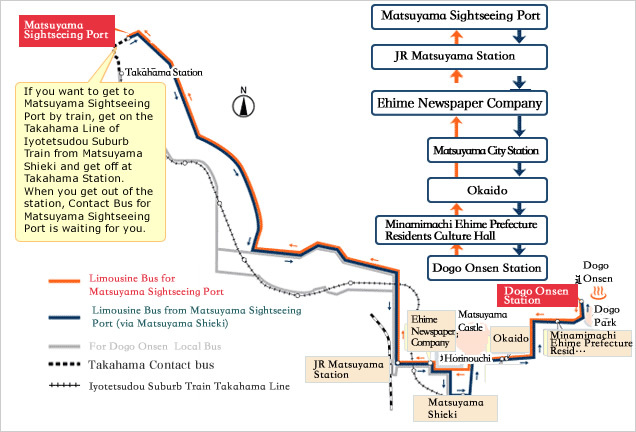 The buses leaving Matsuyama Sightseeing Port at 21:00,22:15 and 22:35 don’t go farther than Matsuyama City Station. Note 1:The taxi fare might vary depending upon the traffic because they account for both the distance and the time. Note 2: The estimated fare above includes tax. 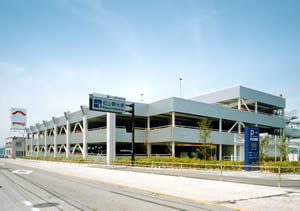 These are rent-a-car companies near Matsuyama Sightseeing Port Terminal.